Each time I sit down to write about the books I picked up in New York and Vermont in the winter, I find myself getting distracted by the weather outside or growing uncertain of the words to choose. One night it was windy and cold. The cat would perch herself either on my legs or the computer whenever I started to type, something she hasn’t done much since she was a baby Tiny Cat. Another night, it was a weekend filled with rain and grey clouds, yet as the sun began to set, there were wisps of pink dancing across the tops of the neighboring buildings. And today, as I am determined to finish this post, now almost three months after I began, the sky is a bit grey and there’s a cool breeze coming through the window as unseen birds chirp outside. For most of 2017, I was a self-imposed book-buying ban. The rules were vague, as I did pick up new books when I traveled (as evidenced by the number I brought back from this trip) or I’d pick up a copy of a book I had been eagerly waiting to be published. The goal was to limit my book intact, as I already own many titles that I want to read but haven’t gotten around to yet. The bookshelves are crowded and there are titles that I don’t see myself revisiting, so until I free up some more space, I am attempting to be more thoughtful about my purchases. Since last year, I’ve also found myself reaching for whatever title is on my nightstand, instead of spending hours watching the latest shows, and looking forward to spending a few minutes or hours in the world of my latest story. Though sometimes that’s easier said than done. Mr. H and I spent the two weeks around Christmas and New Years in New York with the plan to head up to Montreal for a few days after a brief stop in Vermont. We never made it to Canada, partly due to the -30F weather that would greet us when we arrived, and partly due to the fact that we were having too much fun in Vermont. I was captivated by the landscape, the snow, the people, and found myself contemplating buying an old farm house and a couple sheep and writing all day long. Can we also take a moment to appreciate how nice the air is in Vermont? It was so fresh and crisp, and reminded me a bit of the air at home. It was also the air I remember smelling during my first Christmas in New York as we walked past the abandoned trees on the sidewalk. There’s this smell that air gets when it’s really cold, which is something I don’t often get to experience living out in LA. The Strand is best known for having 18 miles of books between its three floors, its author events, and for being one of the most recognized New York bookstores. I was first introduced to the idea of the Strand at sixteen when my parents surprised me with a birthday trip to New York. While we rode the subway after an excellent dinner of sesame chicken in Chinatown with a family friend, she told me that I should get off the subway at Union Square and go explore the Strand. I didn’t make it until years later when I was out for a weekend with my mom for grad school auditions. It is now one of my go-to spots whenever I visit. The Strand constantly surprises me with the books it has available. I often find out of print titles that I’ve been searching for, and last time I even found a Persephone Books title hidden away in fiction. I’ll start wandering through the store with a specific title in mind, but will then end up running around the various floors as new titles come to mind. This time I started off by looking for Emily Wilson’s new translation of The Odyssey and then 1606: William Shakespeare and the Year of Lear, both which were presents. Then I found myself turning down the English history aisle to see if they had a copy of The Last Lion: Visions of Glory by William Manchester. The original hardcover is now out of print and they had one copy available. Four or five years ago, my dad bought me the newly released and final book in the series after I had a dream that I was in the war cabinet room with Winston Churchill and we had to solve puzzles in order to get out. A year ago I found the second book at an estate sale, and now I have completed the set. I kind of like that each book has a different cover and came from a different place. I’ve only read part of the third book, titled The Last Lion: Defender of the Realm, and found myself scribbling down notes for a project it inspired. One of these days I’ll go back to finish the series. Down that same aisle, I found an edition of The Letters of Queen Elizabeth I edited by G.B. Harrison. Well, I had to have it. These are the types of treasures that I love finding at the Strand. It’s not a book that I need but it’s a fun to book to have and pick up from time to time. I am also a big fan of books of letters. I got the idea to search for Helene Hanff and see where she might be hiding. For anyone who has spoken to me in the past year, you’ll know that 84, Charing Cross Road has become one of my favorite books and one I keep recommending for people to read. I knew there was a follow up book that Helene had written when she finally went to London, but it too has been out of print. I considered buying an edition online that would match the style of my edition of 84 yet the temptation of finding it in person, hidden among the stacks was too tempting so I continued to wait. This search led me downstairs to the letters and essays section, which is where I found the slim, pink cover of The Duchess of Bloomsbury Street hanging out. I spent some time saying hello to the Mitfords and Evelyn Waugh only to realize that I have a couple of their correspondence books already. A quick hello to Ginny and then I was off. I bounced from section to section a bit longer before going on a new search for Good Omens by Neil Gaiman and Terry Pratchet, which I have wanted to read ever since I saw the production still of David Tennant and Michael Sheen. With my basket of books in hand, I went to the register before more books tried to jump in my basket. Around the holidays the Strand does a promotion where if you spend a certain amount of money, you get a tote bag too. That is the main way we’ve come to have so many Strand tote bags. I retied my scarf and buttoned my camel out as we headed out into the brisk night, books in toe, with the thought of Chinese food on our minds. Located in Plainfield, Vermont, not far from Barre, on a country road lives a white, two storied house. The Country Bookstore is on the ground floor with the living quarters above. The rooms are stacked high with titles from floor to ceiling, sometimes requiring you to stand on your toes or squatting to read the spines. I made multiple laps around the store to figure out what lied behind each corner, each time being surprised with what I found. We were also there when a large sale was going on which only further incentivized the book buying. My first lap through I stopped at a shelf lined with the green spines of Virago Press. I've known about Virago Press and its green spines for a while now but hadn’t seen any out in the wild. Virago is an "international publisher of books by women" which began in 1973 with the mission to "champion women's voices and bring them to the widest possible readership around the world. 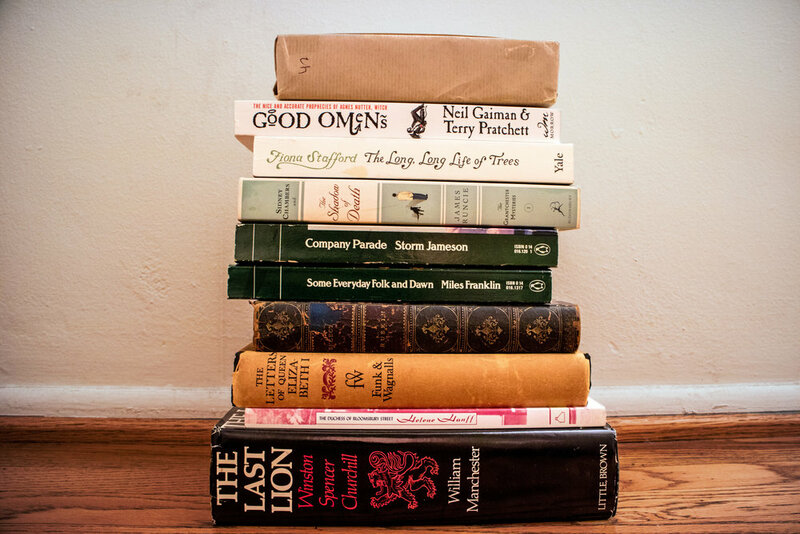 From fiction and politics to history and classic children's stories" . Their mission feels very much in line with Persephone Books. This year marks the 40th anniversary of Virago and they've been rereleasing some of their titles with the traditional green spine and beautiful new covers. The two titles I picked up are Company Parade by Storm Jameson and Some Everyday Folk and Dawn by Miles Franklin. 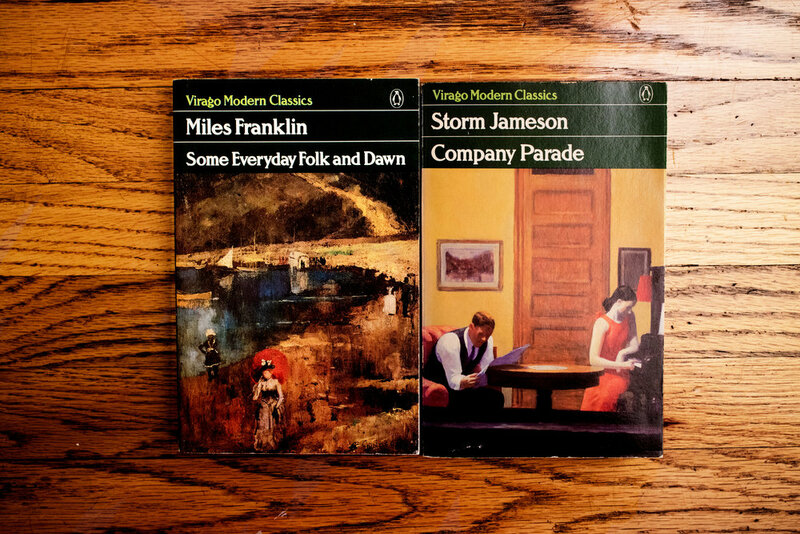 Both belong to the “Virago Modern Classics” and were published by Penguin in the 1980s though the books were originally published in the early 20th century. Company Parade is set a month after the 1918 Armistice as Hervey Russell comes to London to seek her fortune. She’s inexperience and poor, embodies the stubborn will of her Yorkshire grandmother, as she dives into the social and political world of London life. Some Everyday Folk and Dawn is set in 1904 as Women’s Suffrage hits the small town of Noonoon. The fight isn’t won as the male residents are not too keen for women to have the vote, and young Dawn isn’t into the idea of getting married. She’d rather have a life on the stage. Near the front of the store I came across a beautiful leather bound edition of Selections from the Writings of John Ruskin printed in 1888. 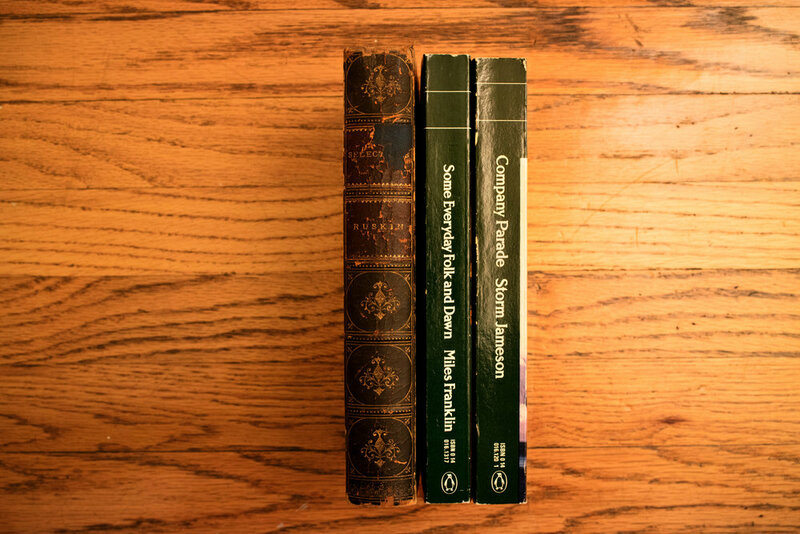 Last October when we visited the Seminary Co-op bookstore in Chicago, I picked up Green Victorians: The Simple Life in John Ruskin’s Lake District. I read a few selections of Ruskin’s writings during my university days but have wanted to revisit his work after picking up the latter title. The owner told me that book used to be owned by the nicest man who used to come to every book event. I like when there’s a piece of history behind a book and to know that the former owner treated it well. I’m sad to say that during transport back to LA, a piece of the spin came away from the book so the title is no longer fully intact. I also picked up a small glass plate that used to belong to – I think – a Victorian lamp. It is a Vermont scene with apple trees. It was in perfect condition when I left The Country Bookstore, but it too received some damage in transit, as there are now fine lines across the image. I am planning on finding a way to store the image so light can reflect through the image as it was designed. During a random 2016 day at work, as I talked about my plans to visit New York in the coming months, I was instructed by Flora that I had to visit Book Culture where she used to work as a bookseller. I had visited the Broadway location across the street from Columbia University during that trip. It really was by accident that I came across the store to begin with as we were waiting for a friend to show up and there it stood. I browsed the shelves with no intention of buying anything when a blue spine with an illustrated teacup below the title caught my eye. The book was The Altogether Unexpected Disappearance of Atticus Craftsman by Mamen Sanchez and it became one of my favorite books of the year. This time around I had an entire day to explore the city on my own. I knew Zabar’s would be one of my first stops before I began my journey toward Lincoln Center and then the West Village when I remembered there was a Book Culture on Columbus Ave between 81st and 82nd Street, only a few blocks away. There was also something about being out and about on a weekday that added to the excitement of the outing. This location is a dream. I found myself looking at socks and pottery as I wandered the store, only to decide it wouldn't fit in my suitcase and to keep moving. My feet took me in the direction of nature books and as I was browsing The Long, Long Life of Trees by Fiona Stafford caught my attention. 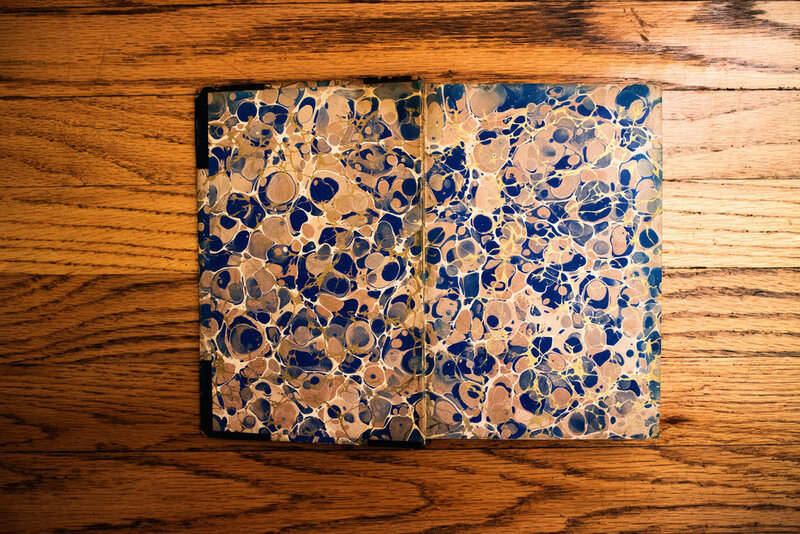 Now this isn’t your average book about trees. It breaks down the history of trees from yew, apple, cherry, pine, oak, and so many more. I am a nerd about trees. I sometimes stop to marvel that trees exist, let alone provide oxygen that allows us to breathe. Since buying this book, I now know two people who have read the book or given it to someone as a gift, and I’ve been told that I need to get to it as it’s a game changer. I also picked out a maroon Book Culture tote bag and a blind date book. Collecting bags from bookstores around the world has become my thing. Three Lives & Co should also be included on this list as well as I did buy a tote from them but walked away with no books. 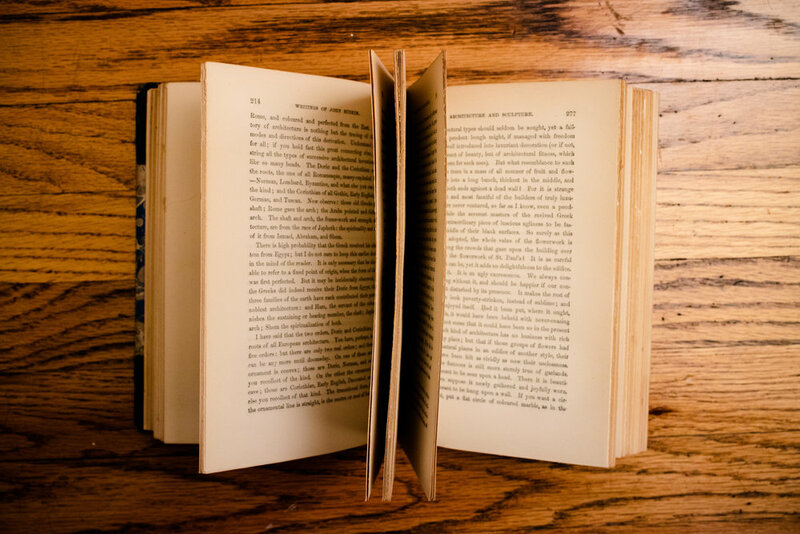 Last time I was there, however, I did walk away with Loving Robert Lowell by Sandra Hochman. 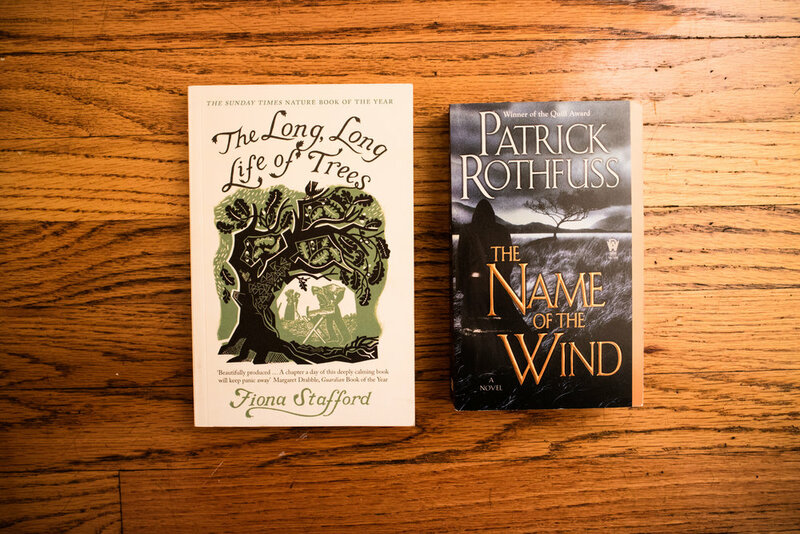 I am not often swayed by the blind date book selection as I like to know what I’m buying before I bring it home but this time I decided to take a plunge and picked up The Name of the Wind by Patrick Rothfuss. I waited until I got home to unwrap it. I still know very little about the book and am excited to find out more. Although I had been told about the Mysterious Bookshop by Mr. H and knew I wanted to visit, I only ended up close enough to stop by accident. I was on my way to CW Pencil Enterprise, with the idea of a late lunch still in mind (it never happened but other foods did along side a healthy portion of the emergency bag of salt & vinegar chips I had bought at Zabar’s that morning), and thought I knew which subway stop to get off of based on a fuzzy memory of the store's street name. My phone was also not cooperating at the time so I couldn’t check to make sure I was right before hopping aboard what I thought was the right train. It was not. When I got off, I found myself far closer to the World Trade Center than I meant to considering that I was supposed to be in Chinatown. That’s when I realized that I was only a stone’s throw away from The Mysterious Bookshop and there was no time like the present to visit. The store is lined floor to ceiling with titles and a ladder waiting for you to climb to the top. There are sections dedicated to Sherlock Holmes and Agatha Christie, displays in the middle for mysteries from various countries, and a door with caution tape over the front, warning you to enter at your own risk. It says you don’t want to cross people who have read a bunch of murder mysteries. 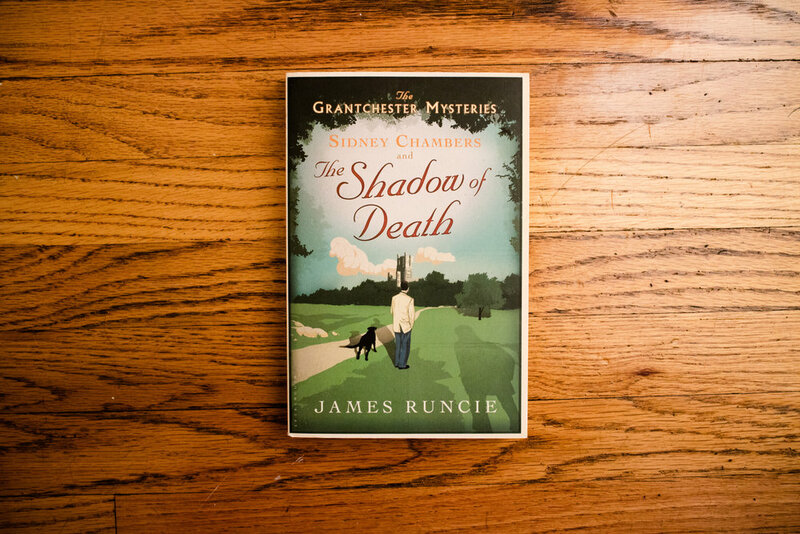 As I was browsing the shelves, I was drawn to the pastel spines of James Runcie’s Grantchester series and pulled down the first of the series The Shadow of Death. I’ve spent a few afternoons in the village of Grantchester sitting at its orchard, soaking in the sunshine, eating scones and Victoria sponge. When I first heard that the BBC series was coming out, I had it in mind to watch but have never quite gotten around to it. Though I was intrigued at how a village so small could have so many murders. If it’s anything like Endeavor or Inspector Lewis then I think I’ll be a fan. As I was preparing to leave, I talked with the shop owner about the snow storm that was on its way. The air outside was starting to get cooler and we were indeed treated to a tremendous snowstorm the next day. I then hopped back on the subway – the correct line this time – and headed off to visit the pencils as the sun began to set.